Like in previous years, the Ulma Family Museum of Poles Saving Jews in World War II in Markowa. joins to the International Holocaust Remembrance Day. The day of all museum initiatives was scheduled for January 25, 2019 (Friday). A study tour “Markowa. Holocaust Memory Trail”, during which participants will learn about the history of Polish-Jewish relations in Markowa and the surrounding area, the times of German occupation in this region, and according to the main theme of the Ulma Family Museum of Poles Saving Jews in World War II in Markowa, about the Polish population who helped the representatives of the Jewish community. The tour will end at the cemetery in Jagiełła-Niechciałki, where the participants will pay tribute to the victims of the Holocaust buried there. 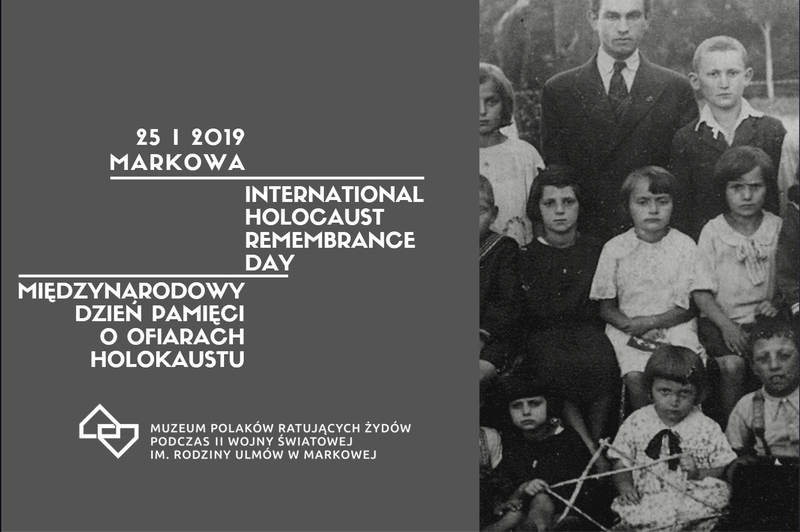 Displaying of the documentary film entitled “Survivors” in the Ulma Family Museum of Poles Saving Jews in World War II in Markowa created thanks to the POLIN Museum of the History of Polish Jews in Warsaw. The film presents the story of several people who survived the difficult Holocaust thanks to the Poles. Free tour of the museum exhibition for all who will come to the Ulma Family Museum of Poles Saving Jews in World War II in Markowa. From January 25, 2019, the temporary board exhibition “On your soil I was destined to sing the song of your land” will be presented in the building of the Rzeszów International Airport. The exhibition was prepared by the Ulma Family Museum of Poles Saving Jews in World War II in Markowa. The boards show the famous peoples of Jewish descent coming from Podkarpacie, including Fred Zinnemann, as well as Sam Spiegel, Arthur Miller, and Abraham Brill. In addition to reminding about the cultural richness of Podkapackie province and its contribution to the development of civilization, the exhibition promotes the region as aware of the potential of its own heritage. The exhibition will be on display until the end of March 2019. The organizer of the event is the Ulma Family Museum of Poles Saving Jews in World War II in Markowa.